Christianity entered the Balkan Peninsula as early as in the time of the apostles, mainly due to the work of the Apostle Paul. After the formation of the Bulgarian State (AD 681) Christianity continued to gain ground among the local population. Bulgaria's relationships with Byzantine Empire had a major role in this process, as well as the usage of Greek in Bulgaria, the exchange of captives, etc. 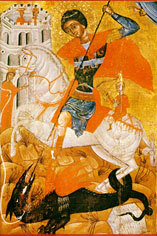 Seeking to achieve stability within the country (by uniting Slavs and Bulgarians) as well as recognition from the other Christian European countries, and lead by his personal faith in the truthfulness of Christianity, Bulgarian king Boris (852-889) in 864 adopted Christianity from the Byzantine Empire. Shortly afterwards the whole of Bulgaria was christened. This political act marked a new beginning in the history of the Bulgarian people. King Boris did a lot to strengthen the positions of Christianity within the borders of Bulgaria. What is more, he sought not only autonomy for the Bulgarian church, but independence too, even though he knew he would not obtain it. Being an extraordinary diplomat, he tried to secure autonomy for the Bulgarian church through negotiations with the two established cultural and religious centres at the time - Rome and Constantinople. Subsequently, on the fourth of March 870, in the final days of the church council in Constantinople, attended also by representatives of the Roman church, the Bulgarian church was officially acknowledged as autonomous, ranked eighth among the eastern churches. In the beginning the Bulgarian church was an autonomous archbishopric under the jurisdiction of the Constantinople patriarchy. It was Constantinople that sent the first archbishop in Bulgaria, Joseph, a well as priests, deacons and liturgical manuscripts. Several years later in 886, the most prominent disciples of the saint brothers Cyrillus and Methodius, authors of the Bulgarian alphabet, were ardently welcomed in Bulgaria. They established the towns of Preslav and Ohrid as the two main religious and cultural centres in the country. Within a short time the two towns managed to institute a rich spiritual and educational movement and the period remained in the history known as the Golden Century of Bulgarian Literature. As a result, at the Preslav council (893) the Bulgarian language was accepted as an official language of the church and the state. King Boris' dream for independence was accomplished by his son Simeon (893-927). In 927 the Bulgarian church was granted independence and status of patriarchy. In the second half of the tenth century political and military consideration led the Bulgarian patriarchy to move its headquarters from the capital Preslav to Drustar, Triaditsa (now Sofia), Voden, Myglen, Prespa and finally Ohrid. During the time of the Byzantine rule (1018-1186) the Bulgarian church retained its independence but not as a patriarchy but as an archbishopric. As such it existed until 1767 when it was terminated by the Constantinople patriarchy. The successful rebellion of the two brothers Petar and Asen in 1185-1186 gave the beginning of the Second Bulgarian Kingdom with Turnovo as capital. Seeking continuity between the church centres of Preslav and Ohrid and led by political considerations, clerics and laymen tried to restore the Bulgarian patriarchy. First a Turnovo-based independent archbishopric was established. Later on, at an Orthodox Church council in the town of Lampsak, Asia Minor, in 1235, the patriarchy status of the Bulgarian church was restored. The church did a lot to accomplish its aims during the time of the Second Bulgarian Kingdom. The Turnovo literature school continued the educational and religious mission of the Ohrid and Preslav schools. The main representatives of the Turnovo school were the Rev. Theodosii Turnovski (+ 1362) and his disciple Evtimii (+ 1404), patriarch of Turnovo. 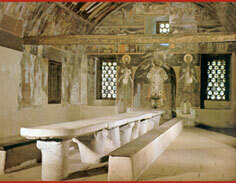 There was also significant advance in terms of architecture and the visual arts. After Turnovo was conquered by the Ottomans (1393) and patriarch Evtimii was exiled, the Bulgarian church lost its independence and became part of the diocese of the Constantinople Patriarchy. Ohrid, the other centre of vivid religious and cultural activity continued to exist until 1767, remaining throughout the centuries a solid mainstay of faith, piety, and patriotism. During the Ottoman rule, which lasted for nearly five centuries (1393 - 1878), the Bulgarian church did not exists as an official institution. In spite of this, through the surviving churches and mainly through the numerous Bulgarian monasteries, the Orthodox faith continued to prop up the Christian and Bulgarian consciousness among the oppressed people. The monasteries were the everlasting spiritual lights. Among the most prominent ones were the Zografski and Hilendarski monasteries in Athos, the Rilski, Trojanski, Drjanovski, Cherepishki, Glozhenski and Dragalevski monasteries. During the Ottoman rule the Orthodox Bulgarian people gave many martyrs in the cause of faith and nation. Among them were St Georgi of Kratovo (+1515), St Nikolaj of Sofia (+1555), bishop Visarion of Smolen (+1670), St Damaskin of Gabrovo (+1771), St Zlata of Naglen (+1795 a. ), St Onfurij of Gabrovo (+1818 a.) and many others whose names are known only to the Almighty. Small schools, such as those in a number of public-spirited towns like Trjavna, Vratsa, Gabrovo, Sofia, Kalofer and others, were opened within many monasteries. Many monasteries also became centres of vivid patriotic activity aiming at liberating Bulgaria from the Ottoman political rule. Paisii Hilendarski (1722-1773), author of the Slav-Bulgarian History, and bishop Sofronii Vrachanski (1739-1813) were among the major figures in this movement and were later canonized as saints. They, as well as many other zealous fighters for religious and cultural enlightening aimed at achieving political freedom, the foremost guarantee for a complete and wholesome expression of the individual and the state as a whole. The outcome of this decades-long struggle was the establishment of the Bulgarian exarchate in 1870 and the liberation of the Bulgarian people from Ottoman rule in 1877-1878. The Bulgarian exarchate emerged as the one church and political entity which sublimated the quintessence of the religious and patriotic in the embattled Bulgarian people, inspiring it with the bravery and courage to strive for national freedom. The role of the exarchate is in this respect widely recognized and duly appreciated. Apart from Orthodox Christians, which make up about 85 percent of the religious people in Bulgaria, there are also people of other Christian traditions - Armenians, Catholics, Protestants, of other faiths - Judeans and Muslims, as well as people form other religious communities - Spiritists, Dunovists, Teosophs, and as of recently also Bahas, Krishnaists, Scientologists, etc. It is important to draw attention to the indisputable fact that in the past as well as at present the different religious communities in Bulgaria - Christian and non-Christian, co-exist quite peacefully, without encouraging religious confrontation or adversity. This does not mean that the Orthodox, who is of the most popular religious conviction, makes compromises with their faith. Rather, they allow everyone to accept and profess their own creed, but when this happens at the expense of the Orthodox faith they response in the necessary way, without, however, offending the religious feelings of anyone. We also need to mention another indisputably important historical fact, regarding the fate of the Jews in Bulgaria during the World War II. A lot has been said on this issue and it has recently re-emerged as an object of attention. The truth is that the factors that led to the protection of the Bulgarian Jews from deportation to concentration camps are different and of varying importance. But it needs to be noted that the Bulgarian Orthodox church, represented by eminent spiritual leaders such as the Sofia metropolitan Stefan, the Vidin metropolitan Neofit, the Plovdiv metropolitan Kiril and others, contributed a lot to the preservation of the Jews. This was prompted by purely humanitarian Christian motivation. This is the place to say something about the Ecumenical movement. A lot of speculation has been going on over this issue recently. The Bulgarian Orthodox Church, through its hierarches and theologists participated in a number of Ecumenical activities dating back to the 20s of the twentieth century. The names of the Sofia metropolitan (later Bulgarian exarch) Stefan, the Vratsa metropolitan Paisii and especially Prof. Archpriest Dr Stefan Tsankov, Bulgaria's most famous Ecumenist are among the most important. They have taken part in the work of the World Union for International Friendship between Churches, in Faith and Life and in Faith and Church Constitution. At the third assembly of the World Council of Churches (WCC) in India in 1961 Bulgaria was accepted as a member of WCC. It enthusiastically participated in the diverse activities of the council. For many years Prof. Dr Todor Subev was vice-chairman of the WCC. The situation has changed over the past several years: people with anti-ecumenical positions have started to dominate the senior church management. A decision was taken that the Bulgarian Orthodox Church should leave the WCC, which was effected in 1998. Time will show if this was the right decision. We cannot omit a regrettable fact in the latest history of the Bulgarian Orthodox Church. Early in the 90s certain metropolitans were urged by political considerations to cut their canonical ties with the Holy Synod and created a new Synod, ordained bishops and priests and established their own administration. They claimed that Bulgarian patriarch Maxim had not been elected in compliance with the canons. This resulted in a schism, which persists until now, although in a mitigated form. The rift has had an adverse effect on church life and facilitated the invasion of various Christian and non-Christian movements. As of today the dissenters comprise 2 percent of the clergy and the religious people, while the remaining more than 83 percent have remained in the bosom of the Mother Church. An old-style movement related to the church calendar was initiated recently, a fact that has even further encumbered the mission of the Orthodox Church in Bulgaria. Orthodox Christians have firm faith that the truth will prevail in the long run. Today the Bulgarian Orthodox Church has about 6 million members within Bulgaria. They are divided into 11 eparchies and about 2600 parishes. There are two eparchies outside the borders of the country - the Berlin-based Western- and Central-European eparchy and the New York-based American-Australian eparchy. The synodal publishing house publishes the Tsarkoven Vestnik (Church Newspaper) newspaper and the Duhovna Kultura (Spiritual Culture) magazine. It also publishes religious educational and liturgical literature. Each year it publishes a wall and pocket calendar. There are two spiritual seminaries - in Sofia and in Plovdiv, two faculties of theology - in Sofia and Veliko Turnovo, and a theology department in Schumen. The seminaries and the faculties train clergymen and church staff. The faculties also train teachers and lecturers for the spiritual schools, scientific workers and religious studies teachers for the secondary schools, where the subject is still optional. The orthodox theology faculty in Veliko Turnovo teaches three subjects - theology, iconography, and social activities (which is still under preparation).